Why are faculty building our union? A: Faculty are forming a union because we want to have a stronger voice in shaping our University’s direction and priorities, our working conditions, and the future of higher education. By joining a national union, we can participate more effectively in wider efforts to defend the values of higher education, values that are under attack and erosion, here and nationwide. Organizing a union can reinforce university governance and give us a greater voice on funding, community connections, teaching resources, and tenure lines. For the increasing percentage of faculty who are part-time and non-tenured, that means securing decent pay, job security and a career ladder, and access to basic support for research and scholarship. By working together in our union, we can advocate on workplace issues that deeply affect both our welfare and our ability to be excellent teachers and productive scholars: salaries, health and retirement benefits, teaching loads, sabbatical and leave policies, and the number of tenure-track positions. Who is the Service Employees International Union (SEIU)? Why SEIU? A: SEIU, one of the largest education unions in the country, represents contingent faculty at schools including Tufts, Boston University, University of Chicago, Georgetown, George Washington, and both tenure track and non-tenure track faculty in the California State system. Faculty at the University of Minnesota, a state university similar in mission and size to the UW, are in the process of forming a union with SEIU. In Washington State, SEIU 925 represents faculty at Antioch University and Seattle University, Saint Martin’s University, as well as the classified staff at the UW. SEIU unites 2 million members across the U.S., Canada, and Puerto Rico. 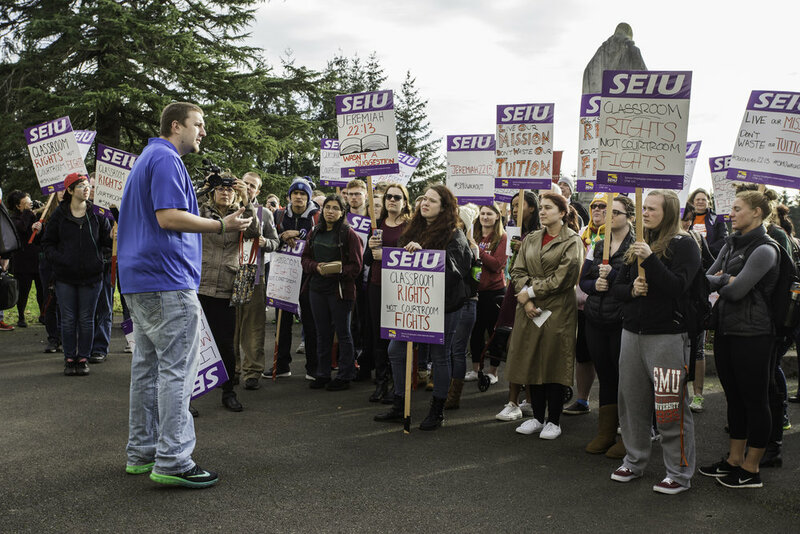 The existing strength of SEIU in Washington State, with more than 100,000 members, means that we would immediately attain a major voice in state politics and higher education legislation. A: SEIU contributes staff time and expertise to a faculty-governed process. Faculty union members can help govern and shape our union through issue surveys, union committees, and serving as elected union officers. In the event of collective bargaining, faculty will elect the bargaining team to negotiate our union contract. Any proposed contract must be ratified by a majority vote of affected faculty. Does a union make sense for professionals like us? A: In Washington State, tenure-line faculty at all the regional public universities have unionized, including Central Washington University, Eastern Washington University, Western Washington University, and Evergreen State College. Faculty at Antioch University and Seattle University have also formed unions. Around the country, prestigious colleges and universities from Rutgers and University of Massachusetts in the East to the University of Oregon, Portland State University, and the California State system in the West have faculty unions to ensure faculty a stronger voice both in their institutions and in their state legislatures. What’s the process of forming a union? A: A union is simply a group of employees who come together to accomplish things they cannot accomplish alone. At any time, faculty can voluntarily join SEIU 925, at reduced union dues, and immediately unite with tens of thousands of faculty and other education employees across Washington State and the nation who advocate for quality, affordable and accessible education. Even before our employer recognizes our union, our rights to work collectively to improve our wages and working conditions are protected by law. In order to negotiate a union contract, faculty need our administration to recognize our union and agree to negotiate with us. Once we have submitted a valid petition for union recognition and demonstrated that a majority of our colleagues support our union, the Washington Public Employment Relations Commission (PERC, for public employers) and the National Labor Relations Board (NLRB, for private employers) can require employers to recognize our union and negotiate with us. Both agencies require at least 30% of affected faculty to submit signed confidential union membership and authorization cards before facilitating a secret ballot election. If a majority of voters cast ballots for the union in the election, then our employers will be legally obligated to recognize our union and negotiate with us. Once our union is recognized, faculty then democratically elect a team of colleagues to serve as a negotiating committee. The committee solicits input about bargaining priorities from the entire bargaining unit. Once the negotiating committee has reached a tentative agreement on a contract with the employer, then we vote to ratify or not ratify our contract. The contract only goes into effect if a majority of us vote to approve it. What will a union mean for faculty governance? A: The collective power of a union can strengthen shared governance. Like other independent faculty organizations, we will advocate for our views within the Faculty Senate and seek to partner with faculty governance wherever possible. By belonging to SEIU, we can facilitate collaboration between the Faculty Senate and a politically powerful Labor Movement to achieve common goals, such as a faculty member on the Board of Regents. We will also expand the circle of faculty engaged in academic life to include part-time faculty who have no voice in faculty governance. Under collective bargaining, the Faculty Senate typically governs academic issues, while the union works on workplace/employment issues. Union members have frequently used the power of their union to protect faculty voice in academic governance. A: Unfortunately, most administrations decide to actively oppose the union and choose to spend tens of thousands of dollars on anti-union lawyers and communications consultants. Regardless of the Administration’s response, our union activity is protected by the law and the strength of our numbers. The Public Employment Labor Relations Act prohibits an employer from threatening us for supporting a union, interrogating us about union activity, promising any benefit for voting ‘no’ or engaging in surveillance of any union activity (meetings, events, email, etc.). How much will dues be? What will dues be used for? A: Union dues are an important part of how we build a strong organization and define who is an official member of the union. Prior to collective bargaining, faculty members of SEIU Local 925 pay reduced dues on a sliding scale of $10 - $25 per month. This gives them full democratic rights and voice within the union. If and when we win collective bargaining and negotiate and ratify a union contract, full union dues are 1.7% of our gross salaries up to a cap of $95 per month. Dues rates are set by a democratic vote of members of SEIU Local 925. Importantly, no one pays full union dues until we have: 1) voted to form our union; 2) bargained our first contract; and 3) voted as a group to approve our contract. In other words, we will not pay any money before we know exactly what gains we’ve achieved through bargaining. We will decide whether our first contract is worth it. What is SEIU COPE (Committee on Political Education)? A: COPE is the voluntary vehicle within SEIU by which union members affect laws that impact our lives. The law requires unions to collect, spend and report political money in specific ways, but it is a crucial part of winning progressive revenue solutions and adequately funding education and social services. The focus of COPE and our local political action work is electing reasonable people to executive and legislative offices who will stand up for working people. Your voluntary involvement and contribution are essential in making this an effective program.